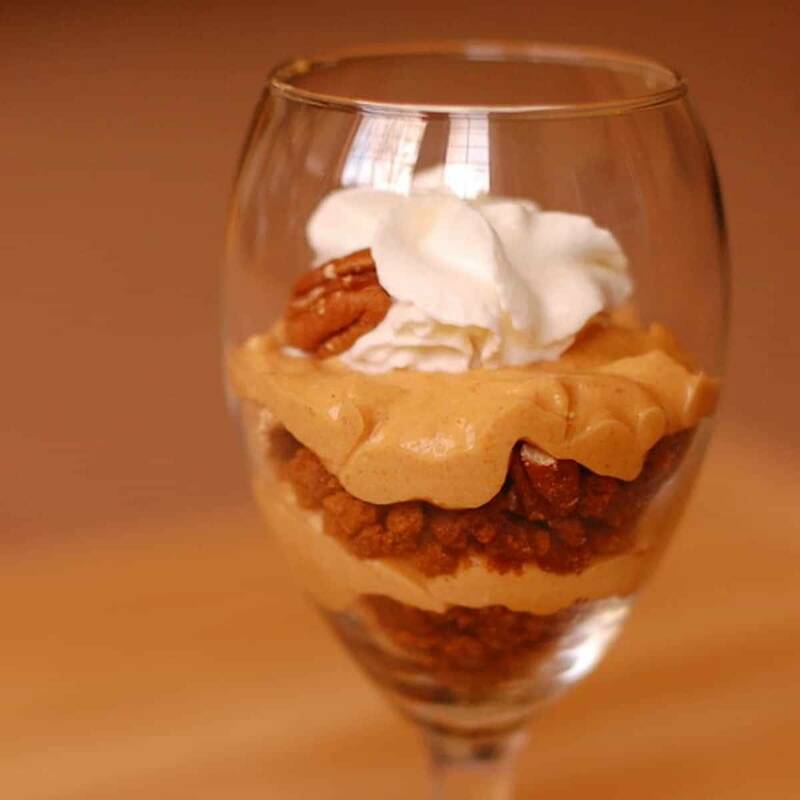 Pumpkin Pecan Cheesecake Parfaits! The bad news is that it’s not exactly health food. The good news is that it’s tasty. Like, go ahead and lick the side of the glass tasty. I’ll be honest here. I am eating my words from a previous post stating that I was bidding farewell to the flavors of fall. That phase didn’t last. Thankfully. Also – a brief word to the wise on the crumbs here. Don’t over-toast them. 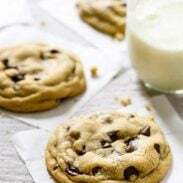 In my imagination, I know instinctively when to take something out of the oven. In real life, I burn things. Note to self: swallow your pride and use a timer. 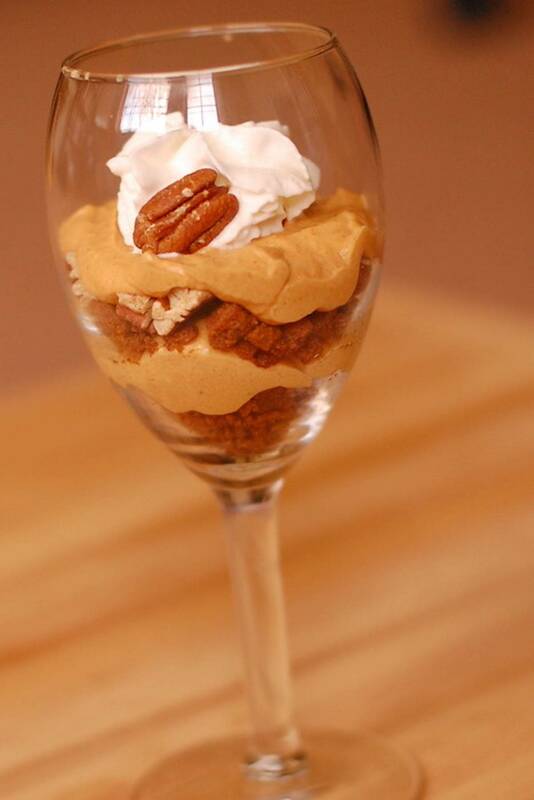 This pumpkin pecan cheesecake parfait recipe is simple and elegant – perfect for an easy fall dessert and nice enough to serve to company. Preheat oven to 350º. Crush the gingersnaps to create crumbs. Add melted butter, stir well to combined. Spread on baking sheet. Toast in the oven 3 – 5 minutes until crumbs start to brown. Cool. Process the cream cheese, sugars, cream and vanilla in a food processor until smooth. Add the pumpkin puree, cinnamon, allspice, and cloves. Process until smooth. Spoon a half of the graham cracker crumbs into four 1/2 cup-capacity dishes, layer on a few chopped pecans. Divide half of the cheesecake mixture evenly between the dishes and top with the remaining graham cracker or gingersnap crumbs and then more pecans. Divide the remaining cheesecake mixture between the dishes. Garnish with whipped cream and pecans. Refrigerate for 1 hour or until firm. I can’t think of a better way to have spent my extra hour today. How did you use your daylight savings hour?